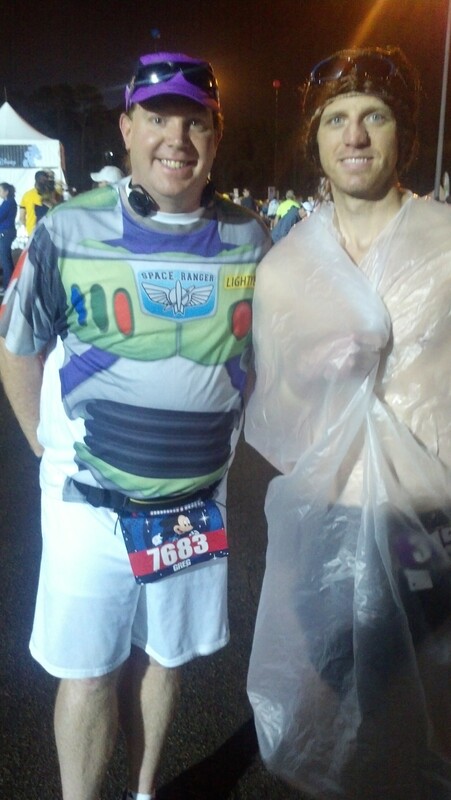 So, the night before the marathon, I had a little chat with Buzz LIghteyear at Downtown Disney. He gave me my final orders from Star Command. After months of training, it was finally time to lift off into the great unknown that is 26.2. 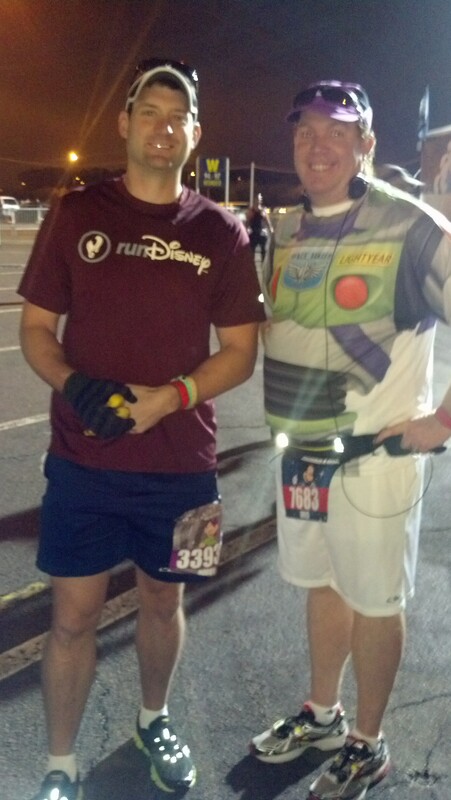 Buzz cautioned me to make sure I got to bed early. After all 3am comes pretty quickly and I didn’t want to waste my months of Star Command Academy training with a poor night of sleep. So, off to bed I went. I was up and ready to go at 3am. 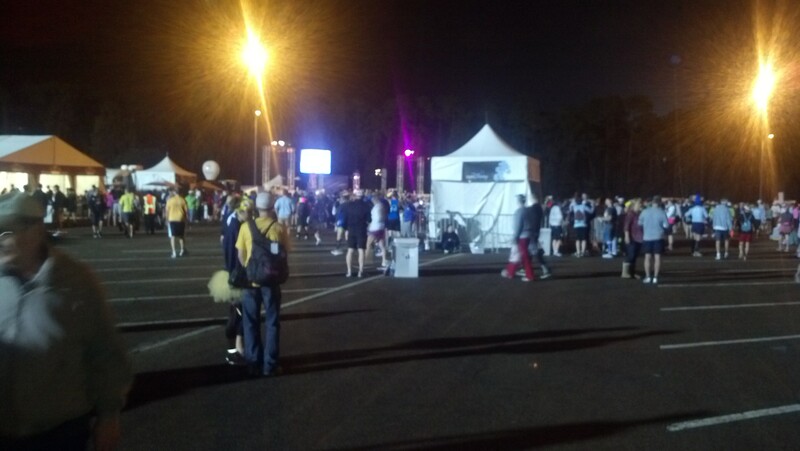 I boarded my transportation to base camp (AKA the EPCOT parking lot) and arrive a little before 4am. Lots of other cadets were milling around waiting for their 26.2 mile journey to begin as well. 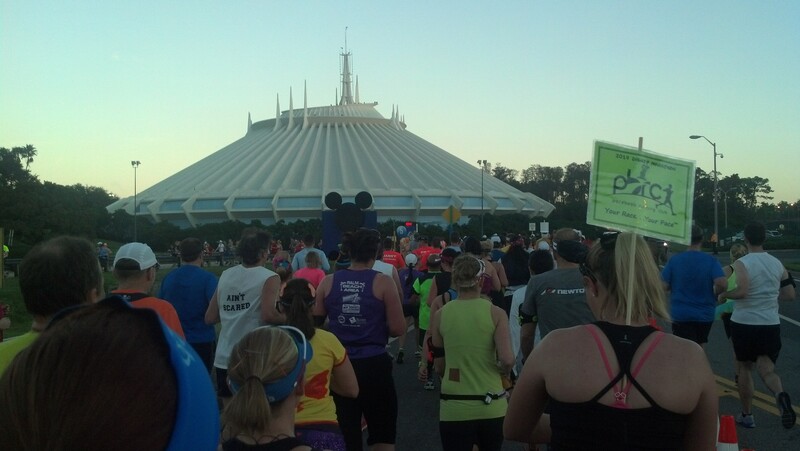 After arriving, the first item in the agenda was a meet up with Team #runDisney. First I found Frank from The Fat Runner and got to chat with him and his brother for a little bit while waiting for others to arrive. Frank is a cool guy who was also running his first marathon. You can read his recap here. 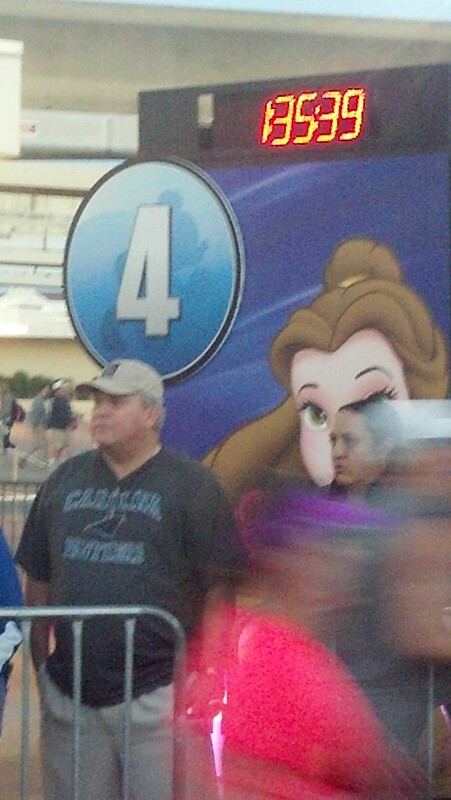 I also saw Mickey from Running with Wishes. After reading Heather’s blog for so long, it was great to finally meet her in person. Both Heather an Bobby were awesome to chat with. 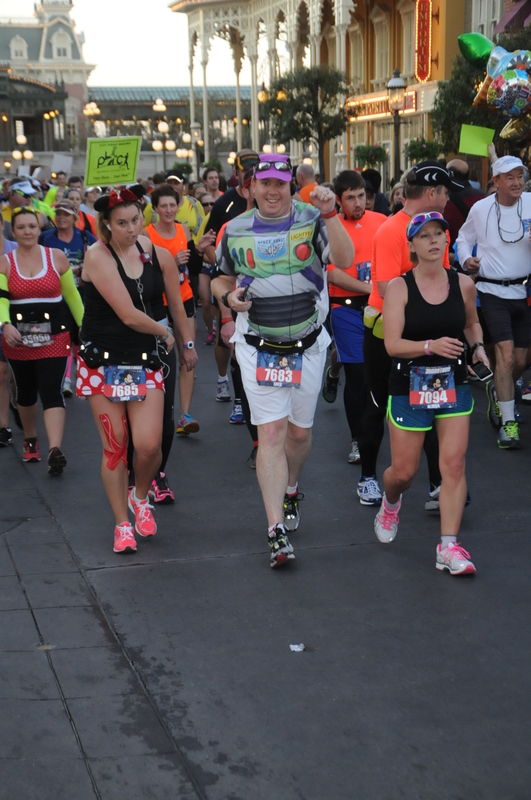 Also, if you remember from my Disneyland Half Marathon Weekend reports, I had seen both Heather and Bobby at the Expo, but never got to formally meet. 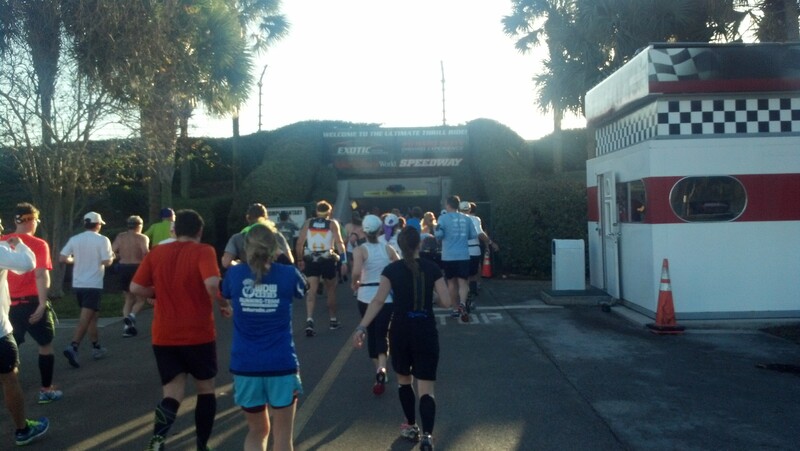 After the meet up, it was time to take the long walk down the Green Mile to the starting corrals. 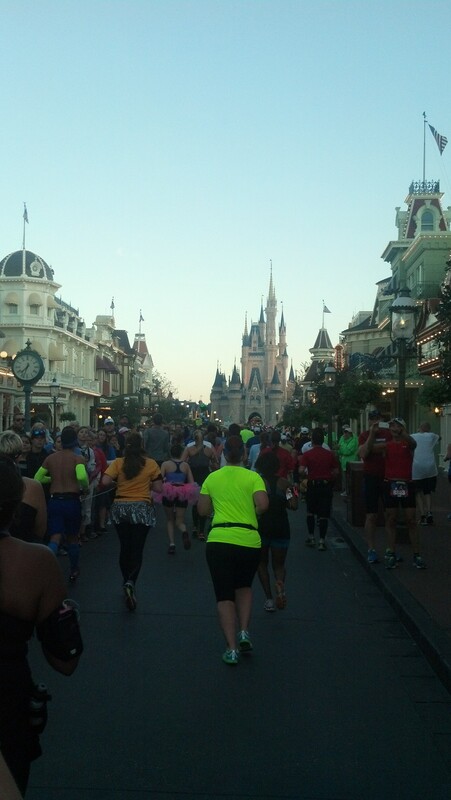 For all of the festiveness of the staging area, the walk to the start corrals was pretty somber. It felt like a bit of a death march. Except for the fact that we all paid to be there. At the end of this walk, they split us off into two areas. 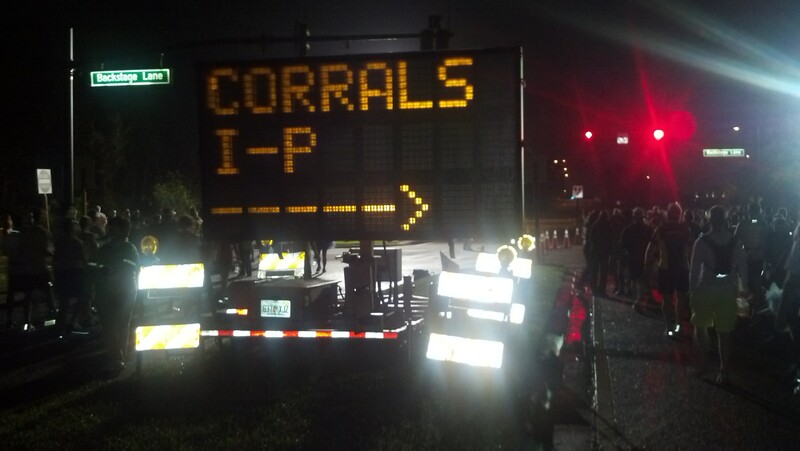 I was in corral L.
Once you make it to your corral, there is a lot of waiting. As you can see, the troops behind me were taking advantage of the time to sit and relax. While I waited in the corral, I noticed someone who is a friend of another blogger I follow. 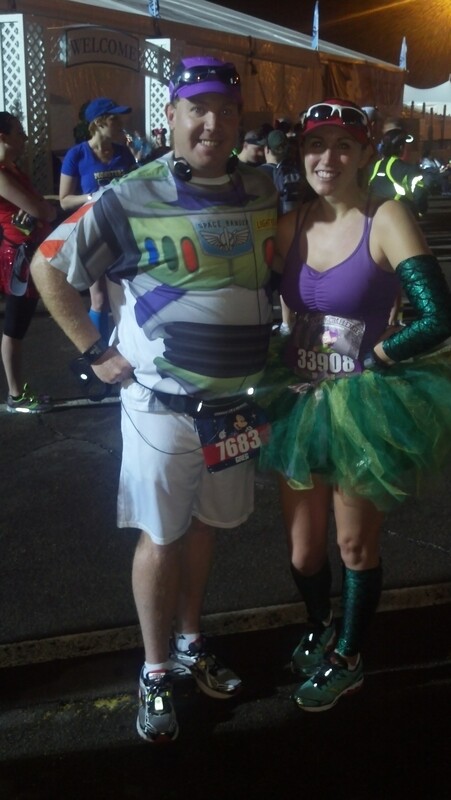 I met her formally at the Team #runDisney meet up that morning and remarked how I recognized her as a friend of this blogger. 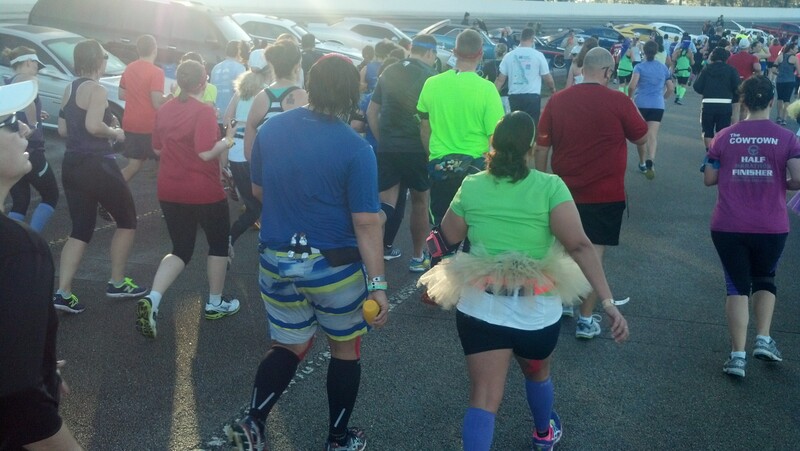 Well, it turns out she was in my corral and had been selected to be a pacer for the race. She asked if I would join her so she had someone to pace. Since she was aiming for a time that I was aiming for, I agreed. We found a few other people as well who joined us for the start. This move changed everything for me about this race. I honestly don’t know how the race would have turned out if I had not made the wise decision to join them. 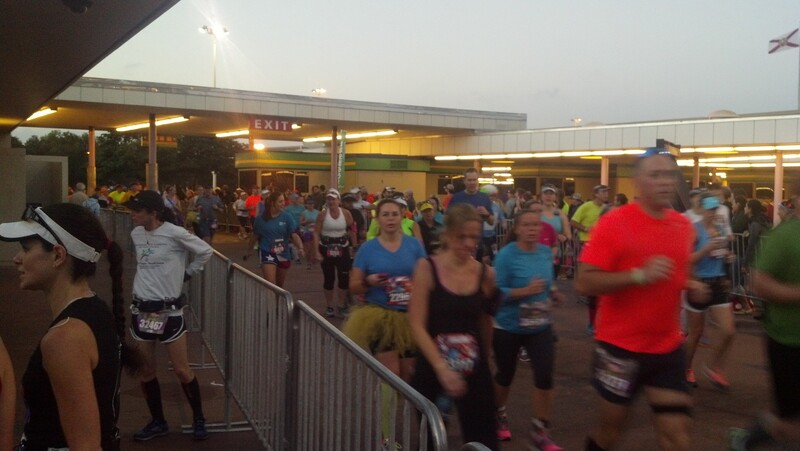 They started off with the elites…then corral A, B, C, etc. 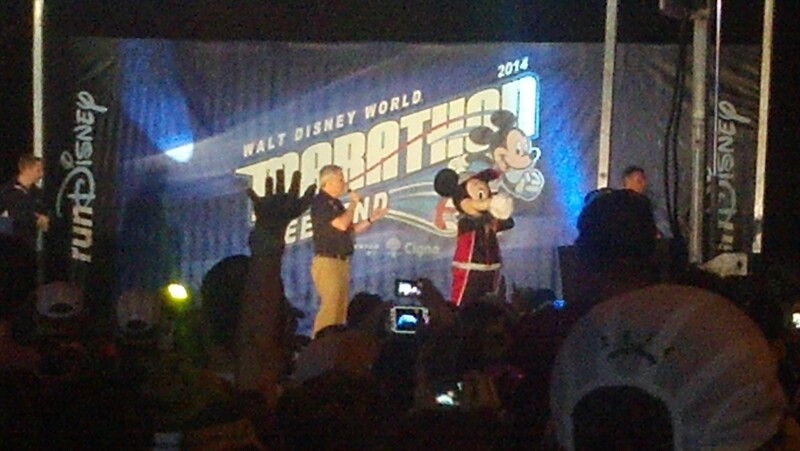 Each group started with fireworks and Mickey Mouse giving a countdown. Hey Mickey! Great to see you! The first mile was pretty uneventful. I spent the time experimenting with the new run/walk intervals that our pacer was setting. 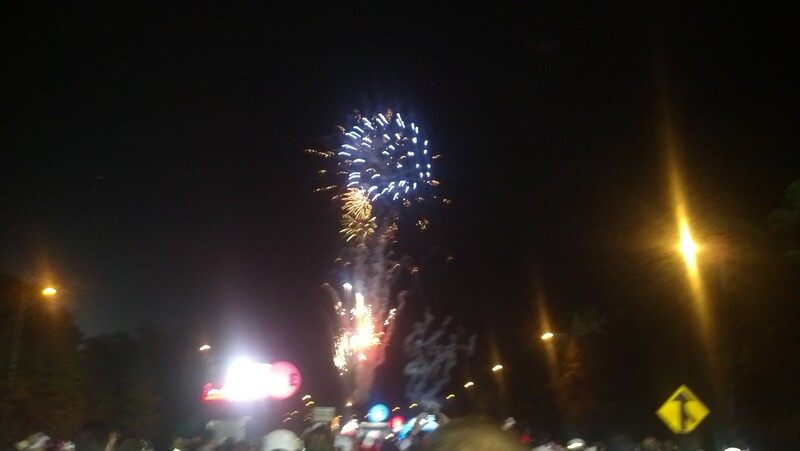 Also, I listenned for the fireworks as the corrals behind mine started. Once corral P started, I knew the Agents of Zurg were among them. 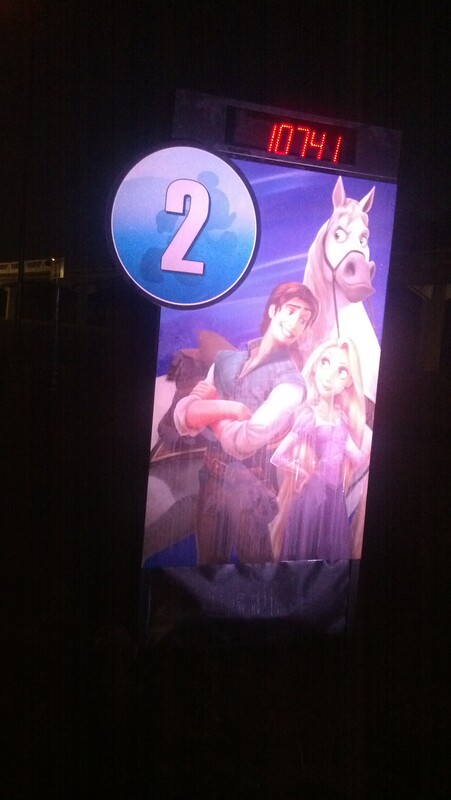 Somewhere in the second mile, we came to the first character stop. It was a pirate ship. So, that meant Jack Sparrow and Captain Barbosa were around. We got to this spot during a run interval. 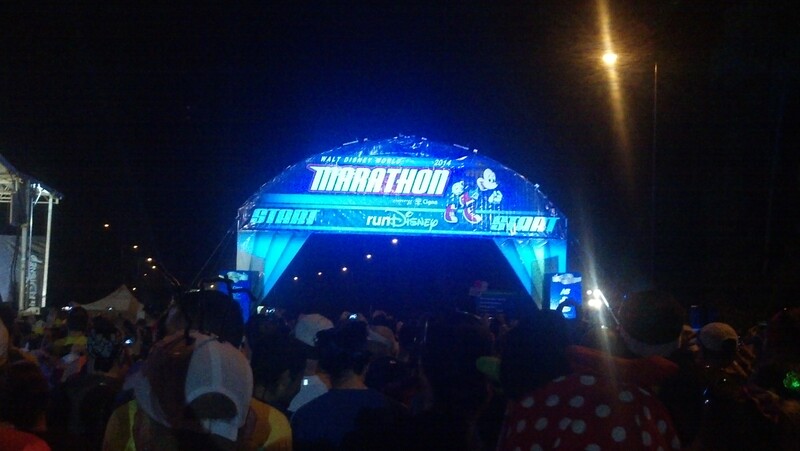 The plan was to run 2 minutes, walk 2 minutes and finish in 6 hours. Since I was running with this group and having fun doing it, I abandoned my pre-race idea of getting pics of every mile marker. 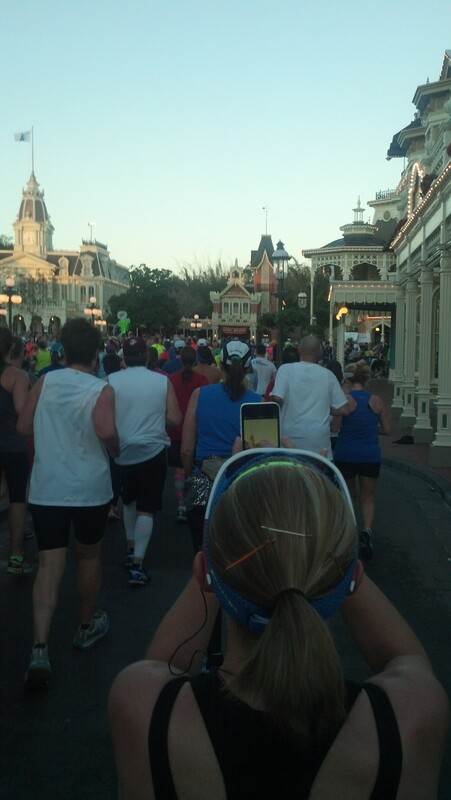 I’d get the pictures I could and tag along with the pace group. I did manage a few mile markers. Here’s the second mile marker. 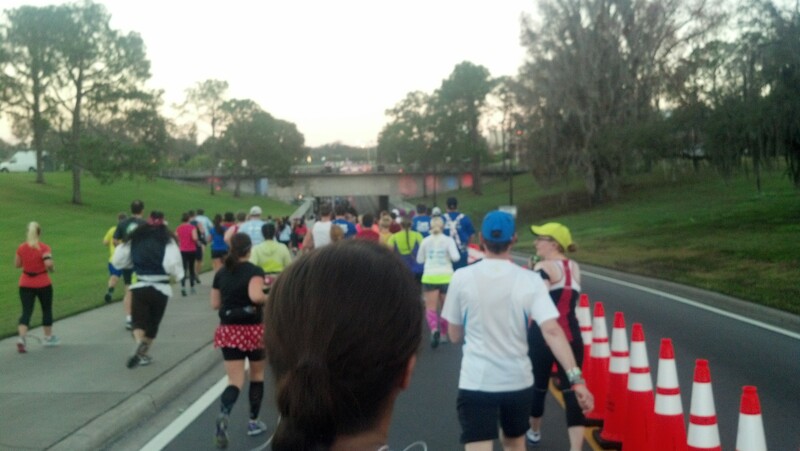 Our pace was slower than I had trained for in the beginning. However, the two minutes of running was agreeing with me quite well. I still have yet to master the art of taking pictures while running. 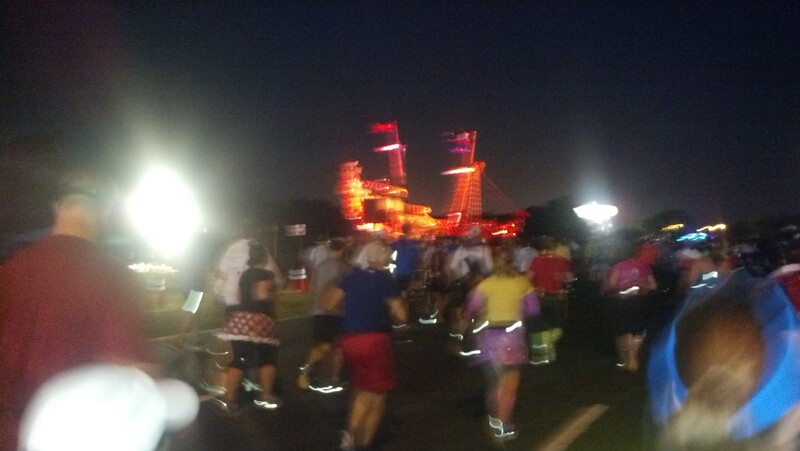 Here’s the best shot I could get entering the Magic Kingdom parking lot in the third mile. Over the past year, I have seen so many pictures of people entering this spot that I really wanted to remember my first time running through it. The theme parks were getting closer! Look! A strange, space ship was coming in. An Agent of Zurg? Nah. It was just the Monorail. We all waved as it passed by. 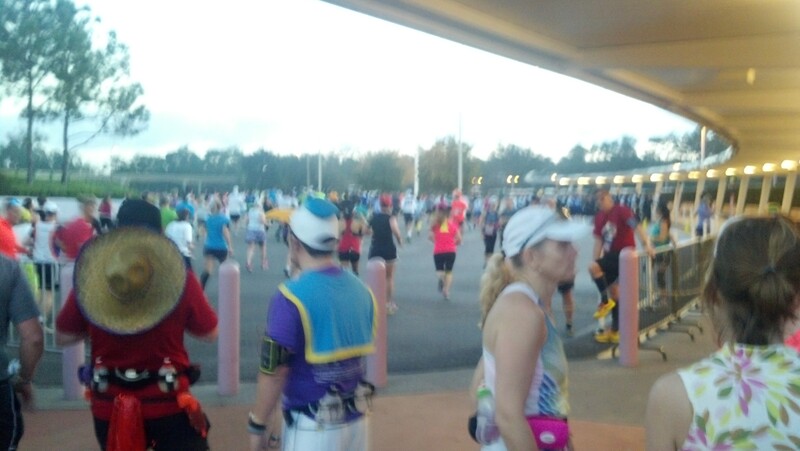 The Mile 4 marker was also the spot where there were real restrooms at the Transportation and Ticketing Center. So, we paused our journey for a few minutes here. After all, the lines were not too long and we were following the orders of our fearless leader Erica. 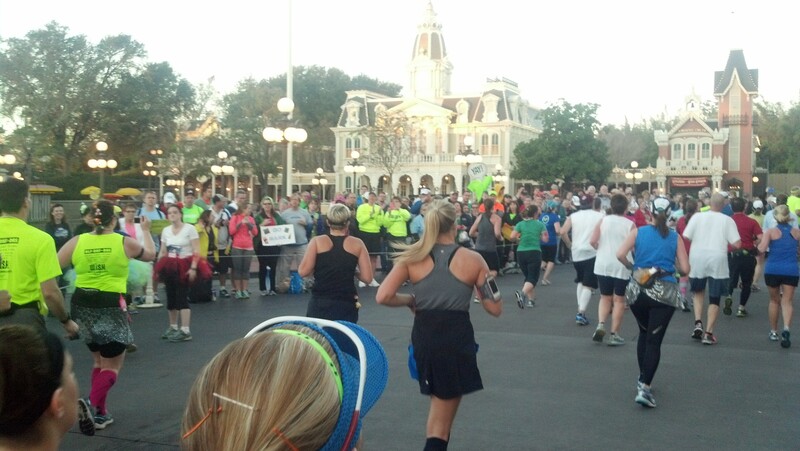 As I waited for some of our group, I got a few pictures of the other runners passing us by. It wasn’t too much longer before we were on our way as well. As luck would have it, we were on a run interval down this little hill and got to walk up the other side. Gotta love the encouragement. Yes, I can go the distance. 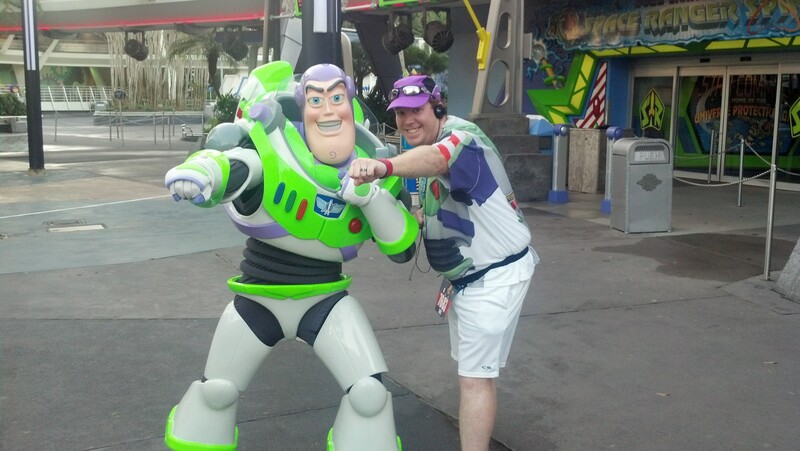 I will not let Zurg….AKA the Balloon Ladies…catch me. 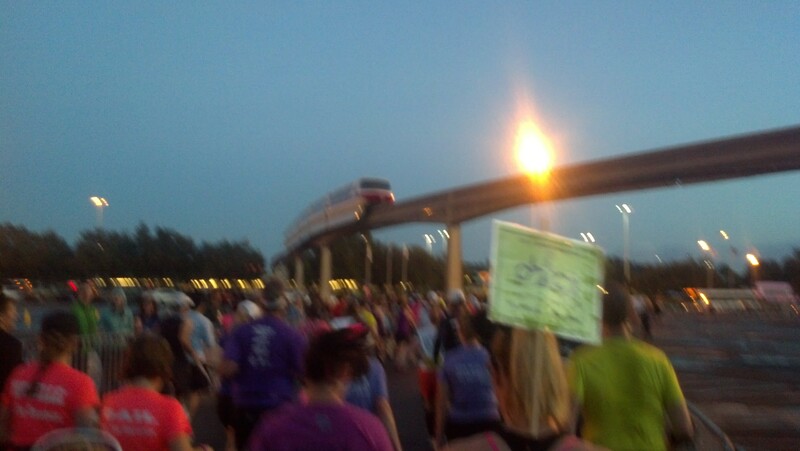 The overpass we ran under is where water flows for the boats to get to the Magic Kingdom. We were almost in our first theme park! Space Mountain! Magic Kingdom here we come! 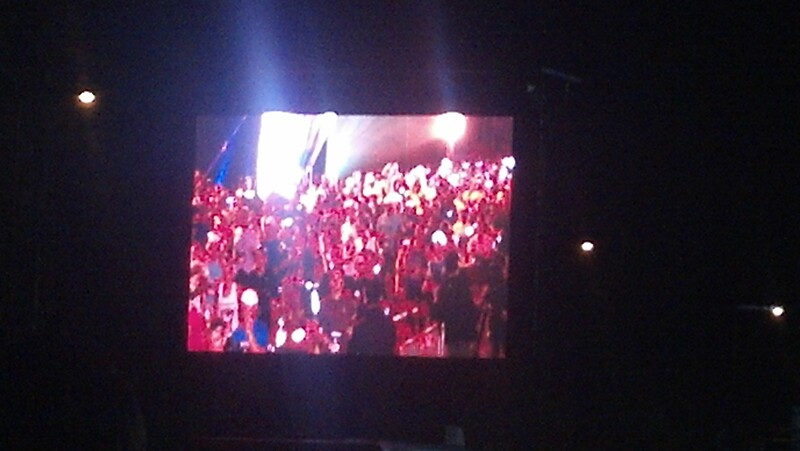 By the way, Erica is the woman with the sign in her back. 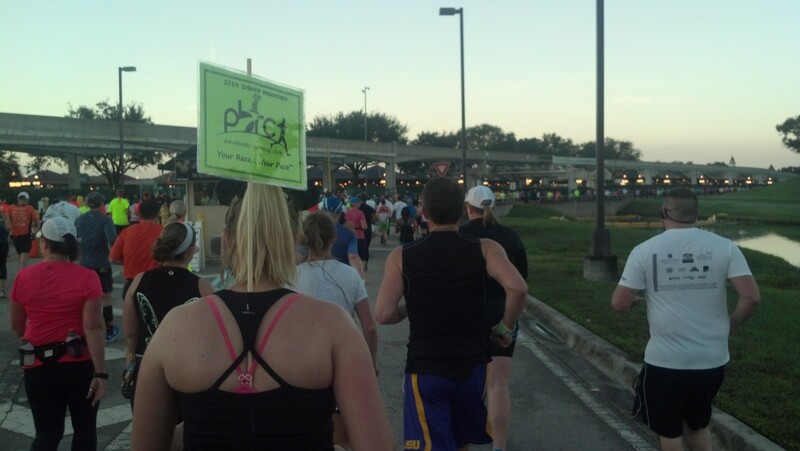 Because her sign didn’t have a specific pace on it, she was asked all race long how fast she was pacing. We’re getting set to enter the backstage area of the Magic Kingdom! As I mentioned yesterday, I’ve never been backstage at the theme parks at Walt Disney World. So, this part of the journey was really cool to me! Getting close to entering the Magic Kingdom! 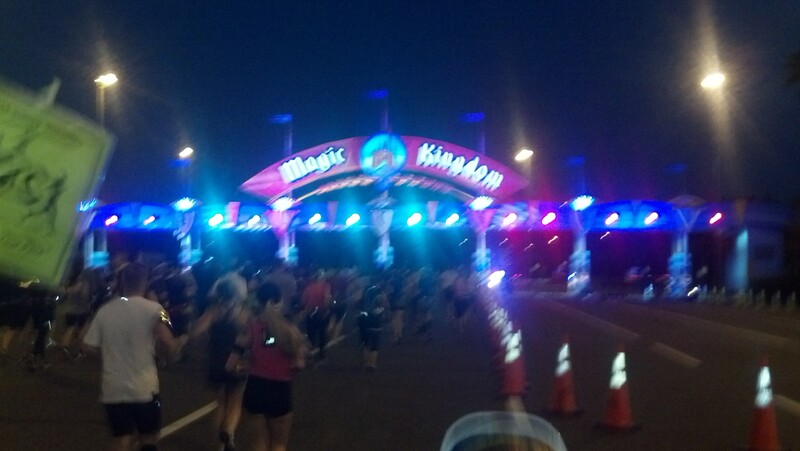 Entering our first major stop on this journey…the Magic Kingdom! I was sooooooo happy to be here! Can you tell? 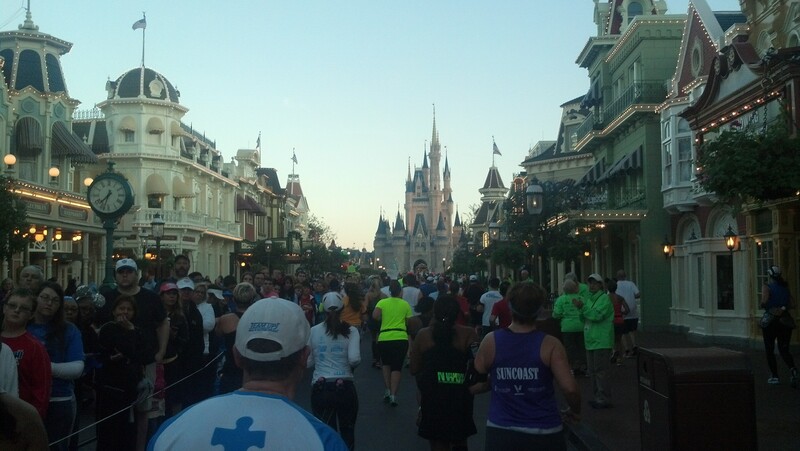 Running down Main Street USA at the Magic Kingdom gave me goosebumps. I was ready to lead the charge! As much as I hate people calling the Sleeping Beauty’s Castle at Disneyland small, it is impressive to see Cinderella’s Castle at the Magic Kingdom. I love both castles for what they are. Our journey up Main Street USA lead to a tun to the right. The tour of the Magic Kingdom lead us to Tomorrowland next. 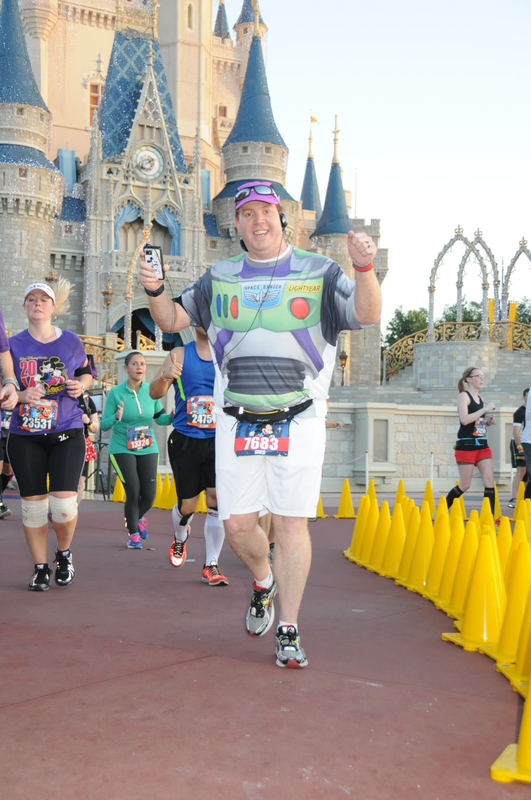 This is where I bid the pace group adieu so I could check in with Buzz Lightyear himself. 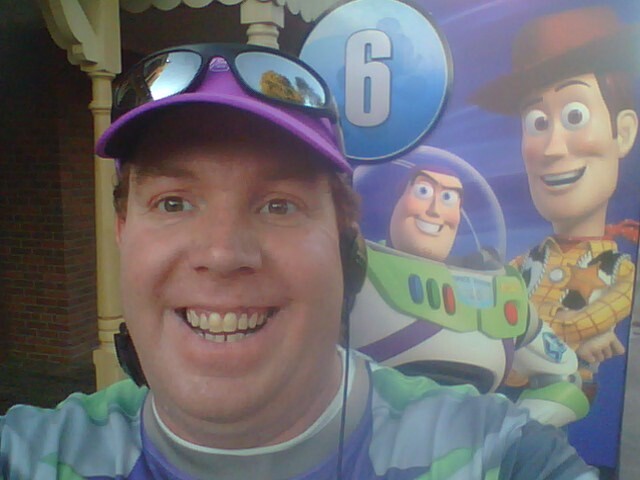 Buzz was happy to hear that I made it this far without any problems from Zurg. He did warn me to keep an eye out as the Agents of Zurg could be in disguise. 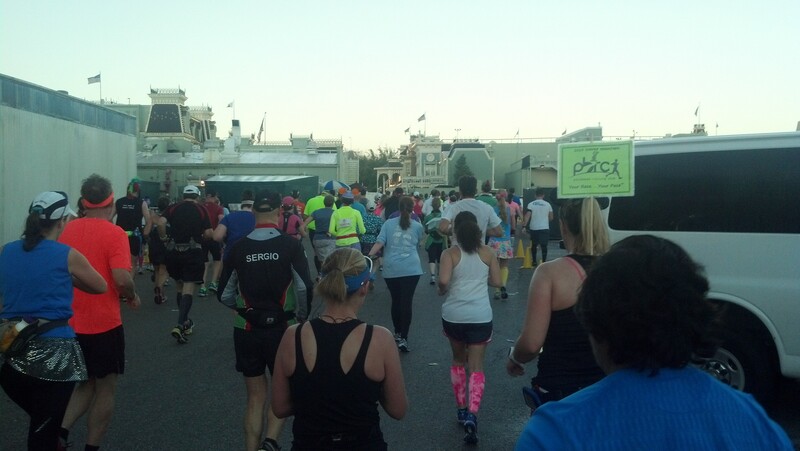 From there, I left and made the journey back to my pace group as fast as I could. 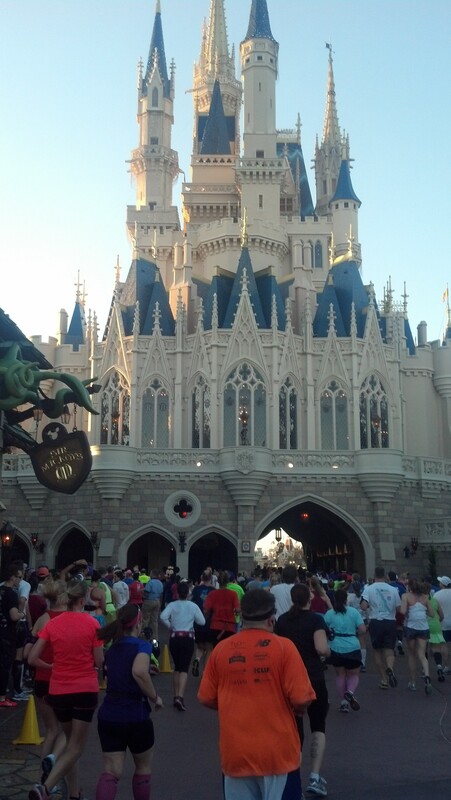 We made our way into Fantasyland and back through the castle. As you can see, the line to meet Prince Mickey and Princess Minnie was far too long for this space ranger to fathom. Also, I needed to catch my group. 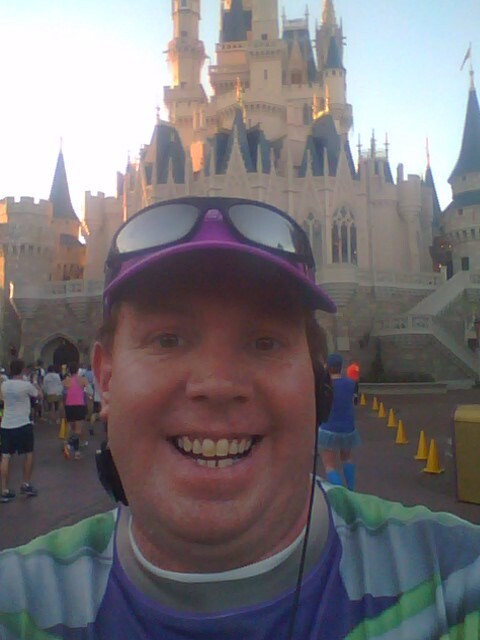 Since you never know if those Marathon Photographers are going to get a picture of you with Cinderella’s Castle in the background, I took this one to remember the experience. 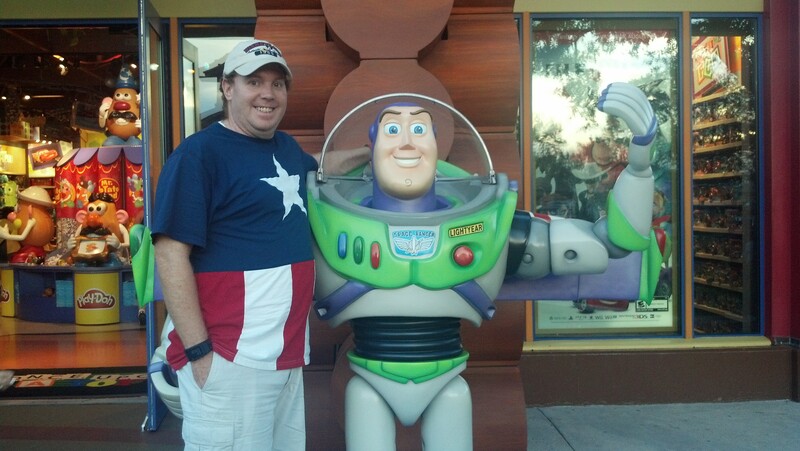 Yep, the life of a blogging Space Ranger caught on film. 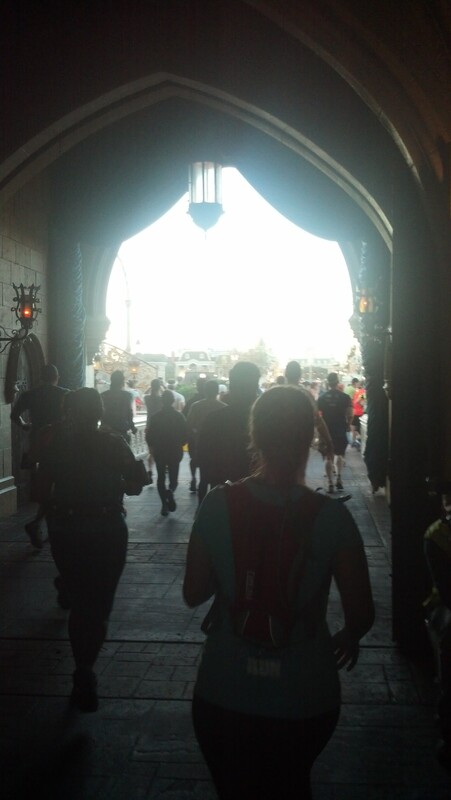 I loved this picture of me coming out of Cinderella’s Castle. 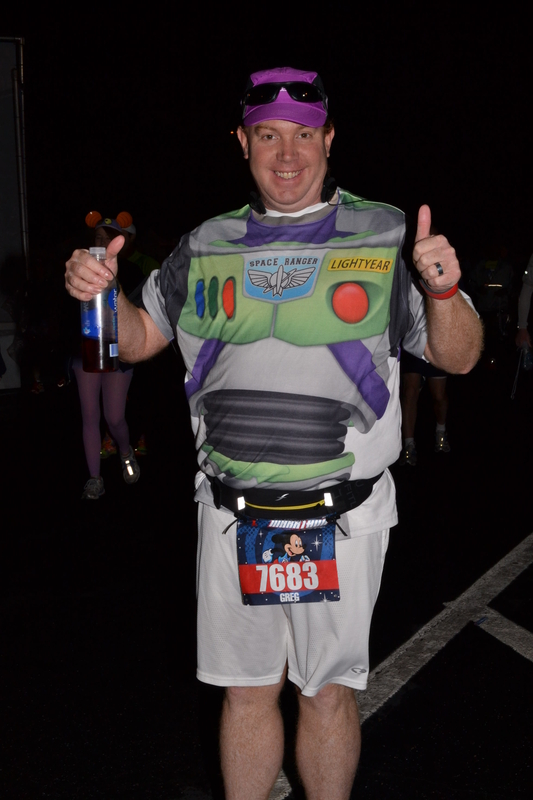 This is one happy Space Ranger. Not only happy, but feeling pretty triumphant as well. 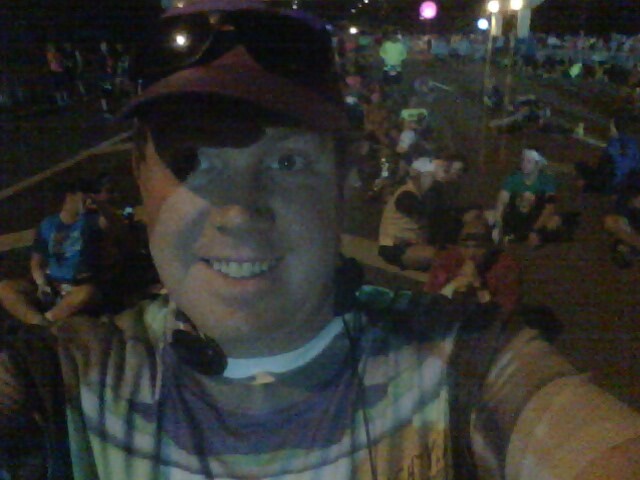 I eventually made my way to the mile 6 marker. Given my mission, this picture just had to be taken. 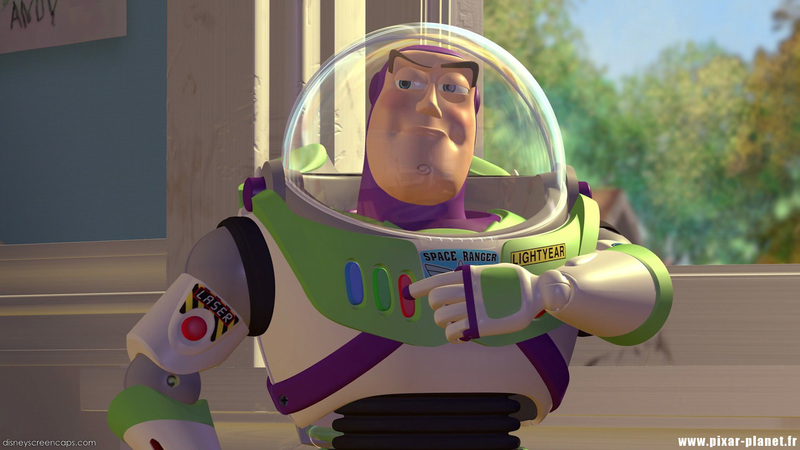 How did Buzz get there so fast? 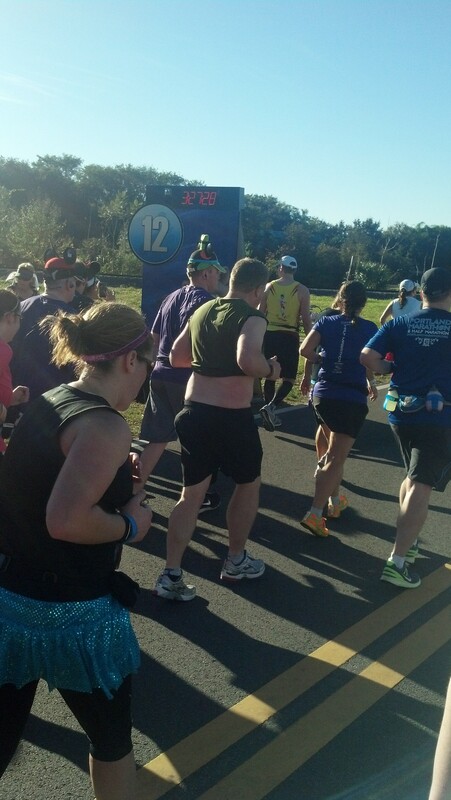 The sun was now out in full force as I caught my pace group before the Mile 7 marker. Sorry the sun hid the number from you. Next up was a trip around a NASCAR track. As you can see the path for our journey narrowed quite a bit here. We were on a run interval going down. 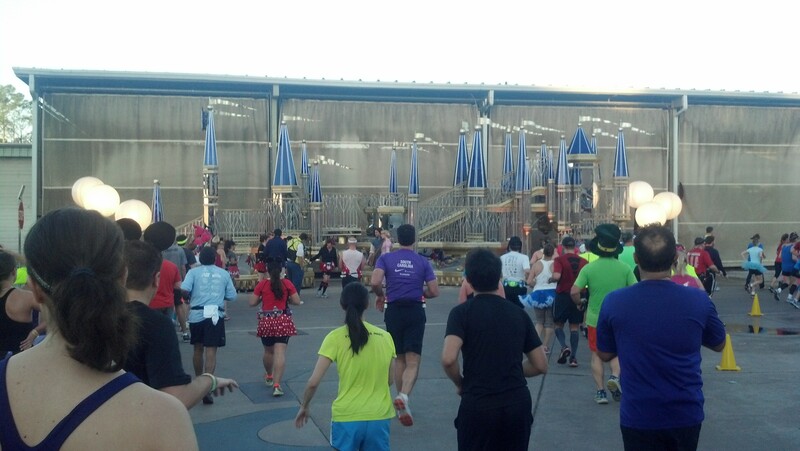 However, it was a slow run because of the crowding. See? I did make it back to my group. There’s Erica. I must say that Erica was a terrific pacer. She clearly knew the course well and would point out everything we needed to know ahead of time. For example, she warned us that the speed track was banked. So, we wanted to stay as close to the grass as we could. I know it’s hard to see, but there were lots of cars along the track. This part reminded me of the Disneyland Half Marathon where owners of various classic cars were out along the roads of Anaheim. Unlike that experience, I could actually see the cars this time. 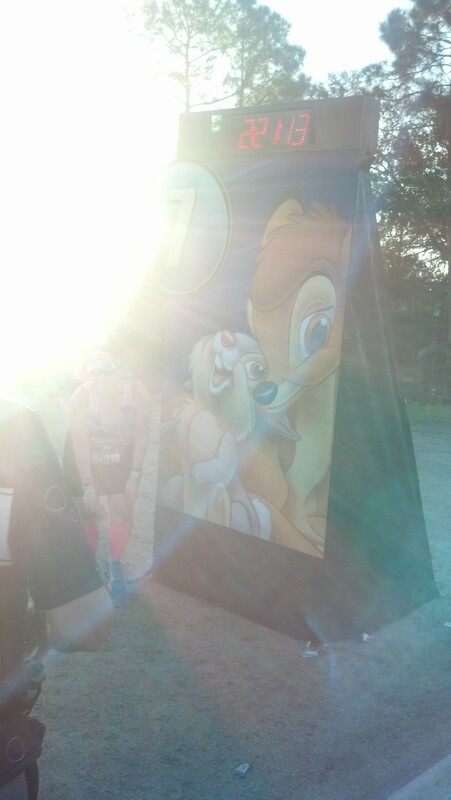 When I ran in Anaheim, the sun was right in my face the entire time. 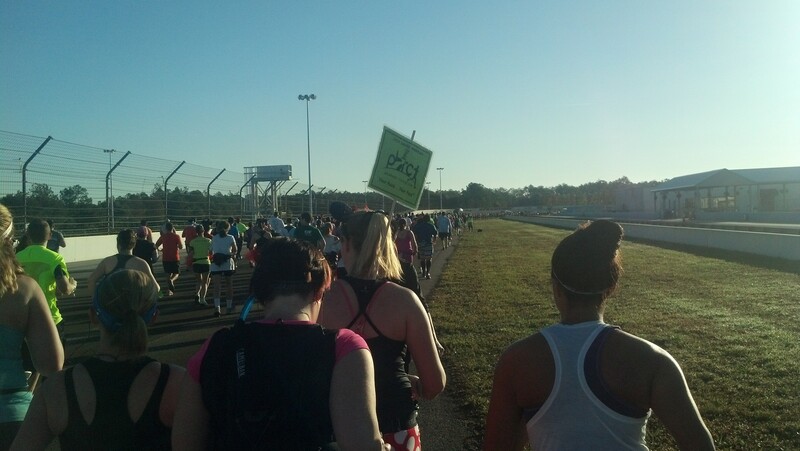 After the speedway, we passed mile 9 and mile 10. This was one of the two “boring” sections of the route that I knew about beforehand. This is a section where I was so grateful to be running in a group. The miles clicked by rather fast because we were all having fun chatting away. 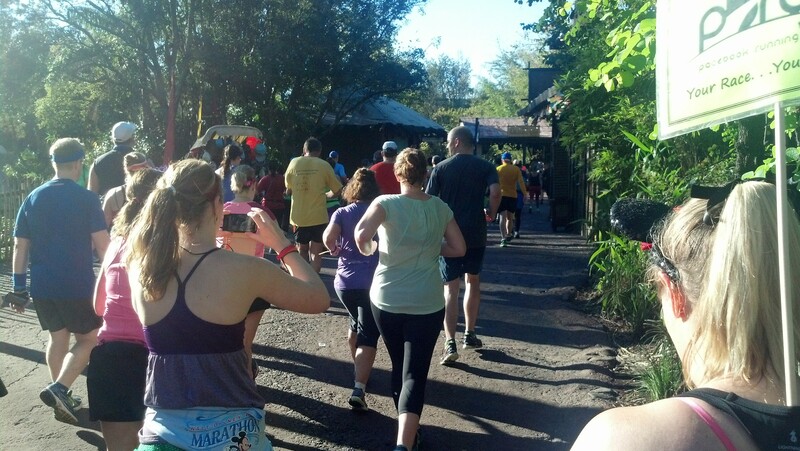 One of the rules in runner etiquette is that when you go from a run interval to a walk interval, you’re supposed to raise your hand to alert the people behind you that you are going to slow down. In our group, this exercise became a game. By the time I lost touch with the pace group, we were all having fun putting up our hands to start our walk breaks. 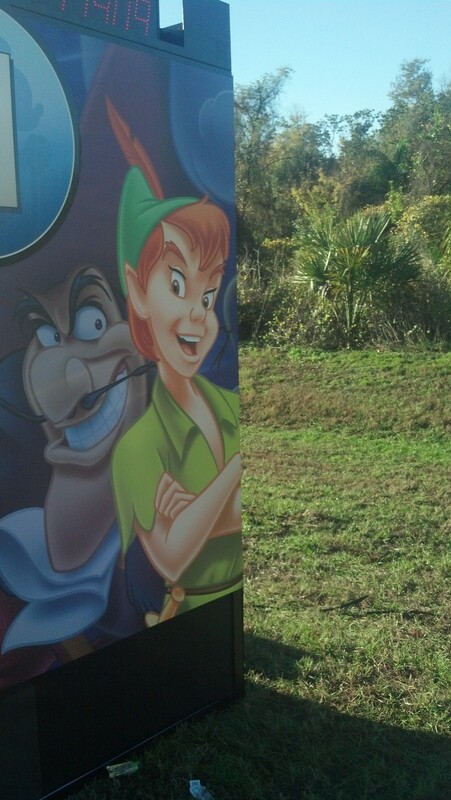 Peter Pan and Captain Hook were on the Mile 11 marker. Again, we were just starting a run interval. 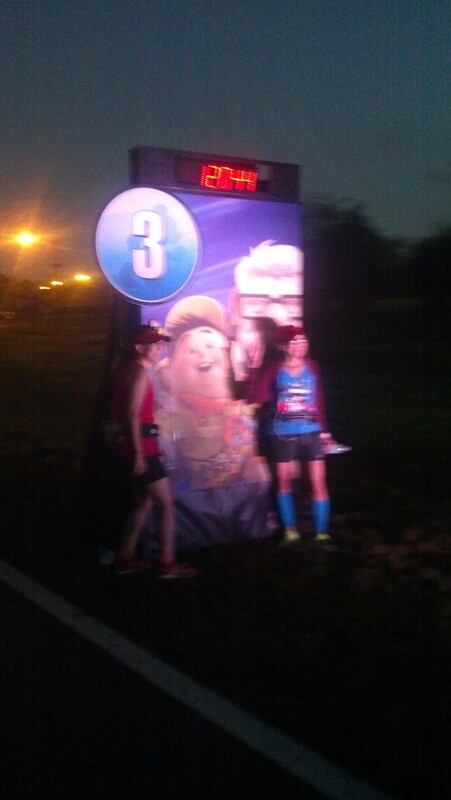 So, I didn’t get the best picture of the mile marker. 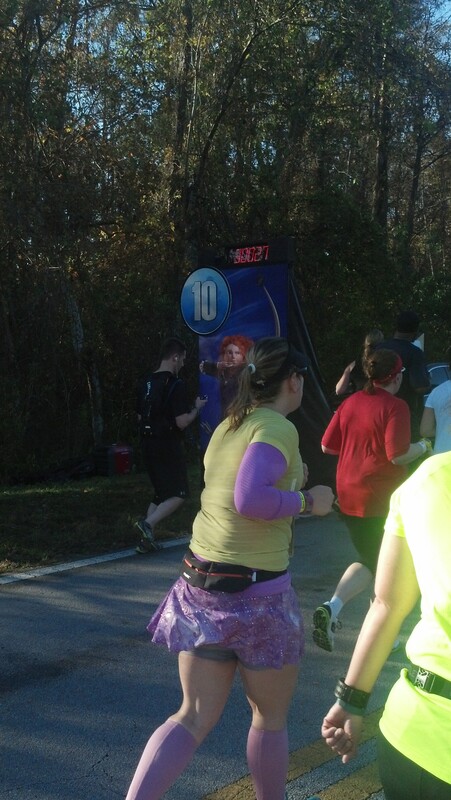 With the mile 12 marker, we were getting oh so close to Disney’s Animal Kingdom! I can’t remember now, but it was somewhere around this point where we passed the sewage treatment plant for the Walt Disney World Resort. Fortunately, we passed it quick enough that the smell wasn’t too awful. 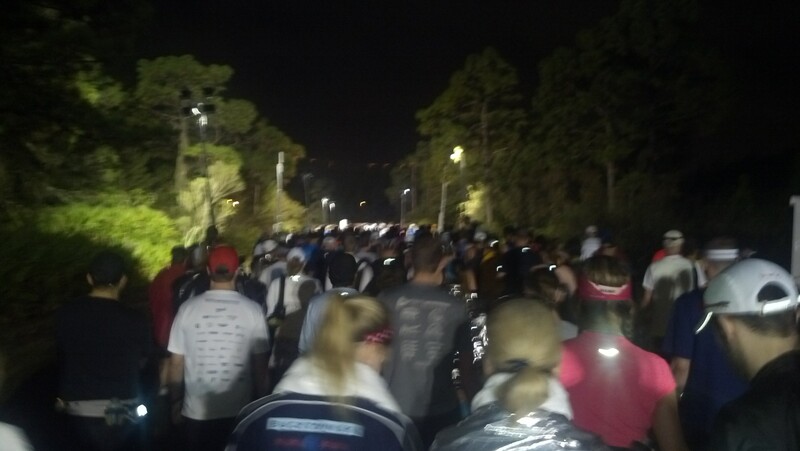 Thank God for the pace group! It saved me from having to deal with that smell for too long. Also, Erica pointed out that we were coming up to that place to prepare us for it ahead of time. So glad she did! 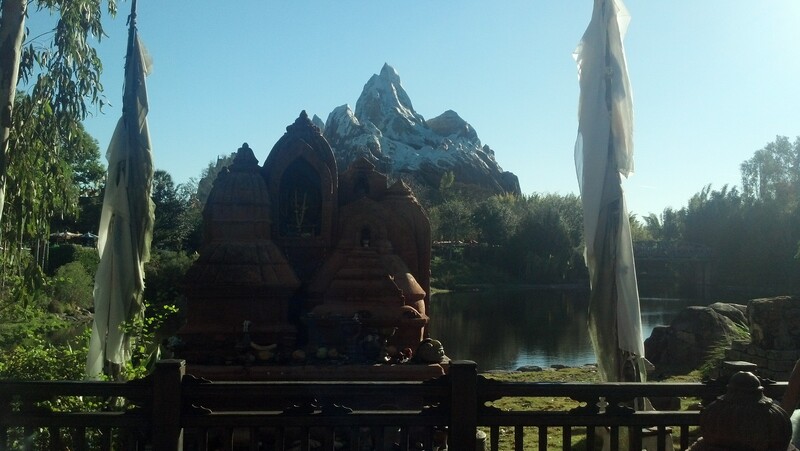 I tried to get a good picture of Expedition Everest. However, we passed by on a run interval. So, this is the best picture I got. Our fearless leader made sure to point out when we were passing the line for Everest. That way, if anyone wanted to ride, they could. 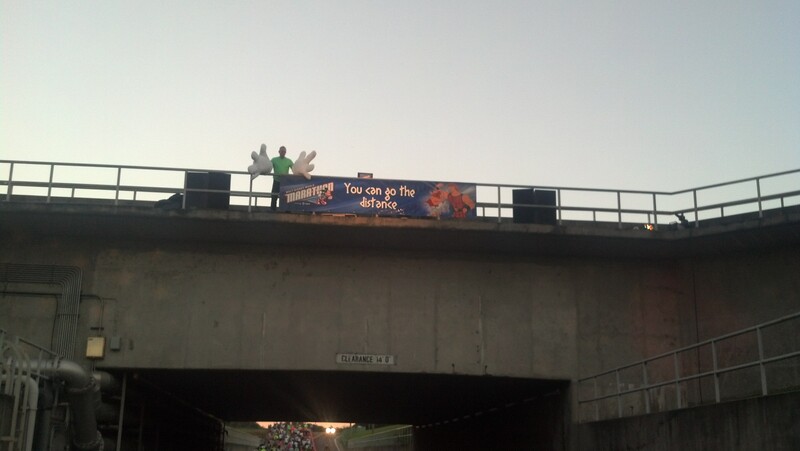 There are a lot of marathoners who take this opportunity to ride. 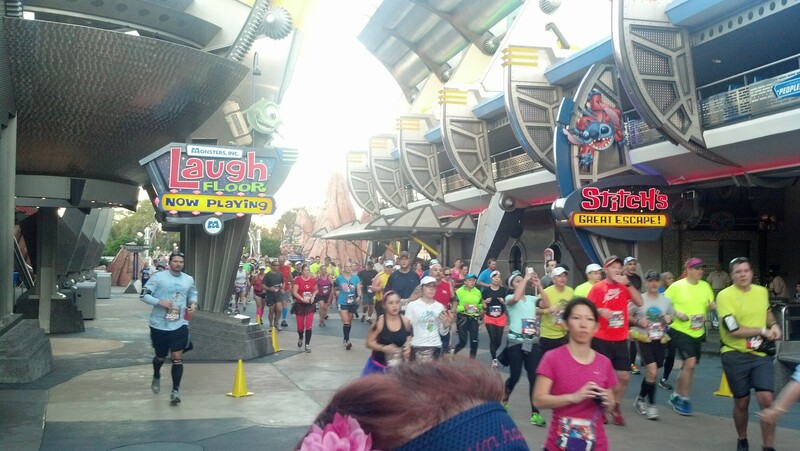 After all, how many marathons can you run in and ride a roller coaster in the middle? 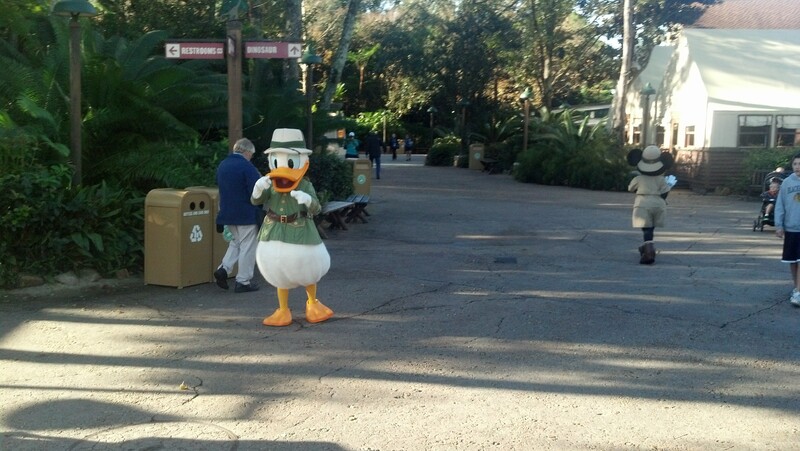 Safari Donald and Minnie passed by as we were walking. So, I got this quick picture of them. We continued on through Dinoland. 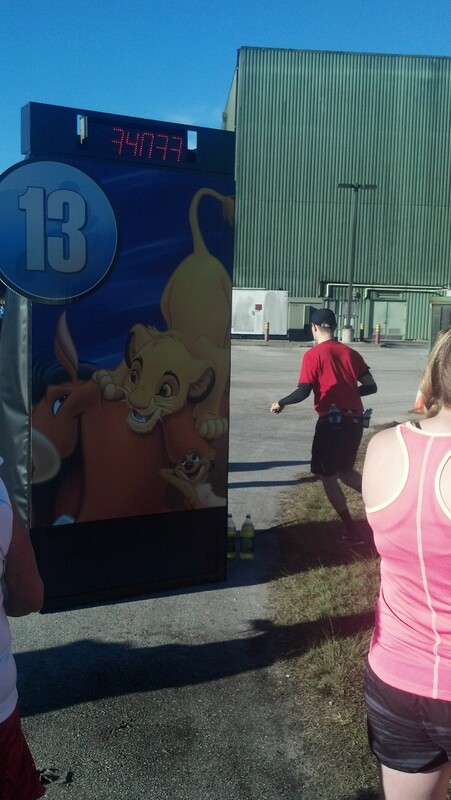 In the backstage area of Disney’s Animal Kingdom, we passed mile marker 13! Soon thereafter, we crossed the mat of the half way point. Even with the bathroom stop, we crossed the half way point at nearly 3 hours even. We were on pace for a 6 hour finish! Oops. I’m getting word from Star Command right now. With the race at its half way mark, they say it’s time to pause this recap and finish it tomorrow. I hope you’re enjoying this journey. It’s been a good race so far. We’re half way to the finish line! But, what will happen in the second half? 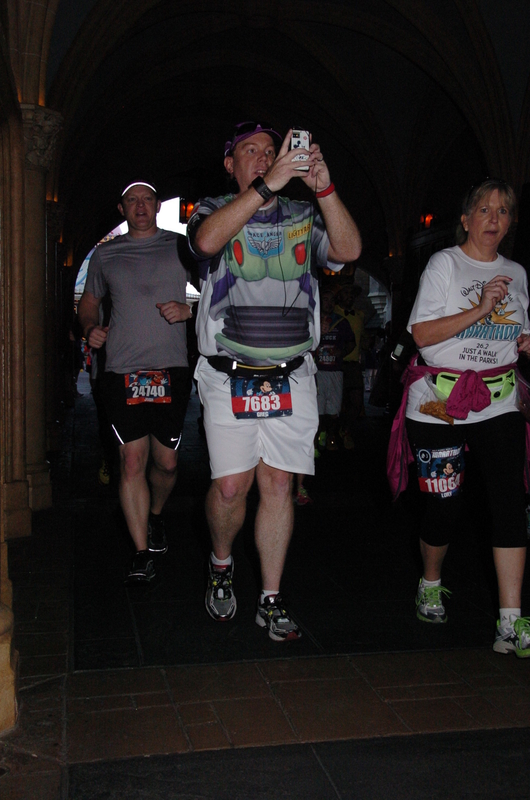 Will Zurg and his Agents arrive in time to keep me from the finish line? You’ll have to tune in tomorrow to see. Loving your recap! Can’t wait to read part 2! Reminds me so much of last year when I ran the marathon! 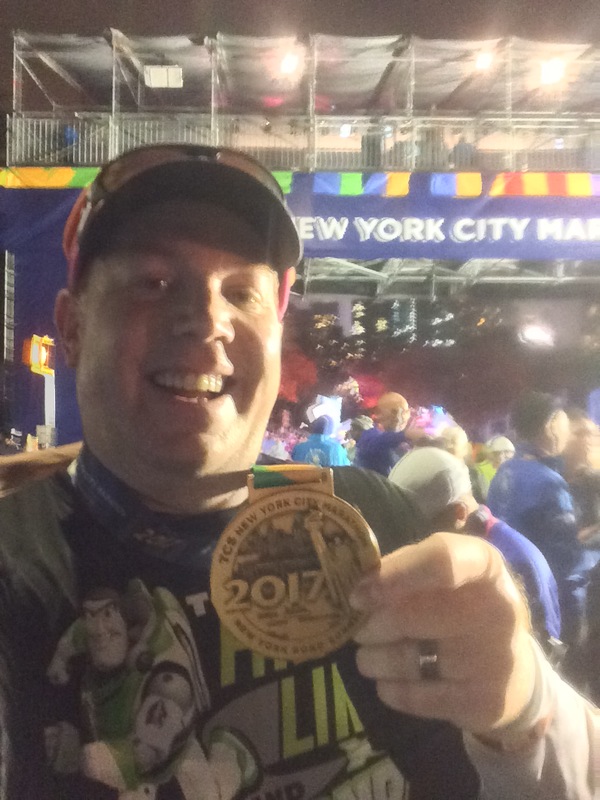 This year I did the 10K and Half! Congrats! Thanks Mindy! Contrats to you in finishing the 10K and the Half! 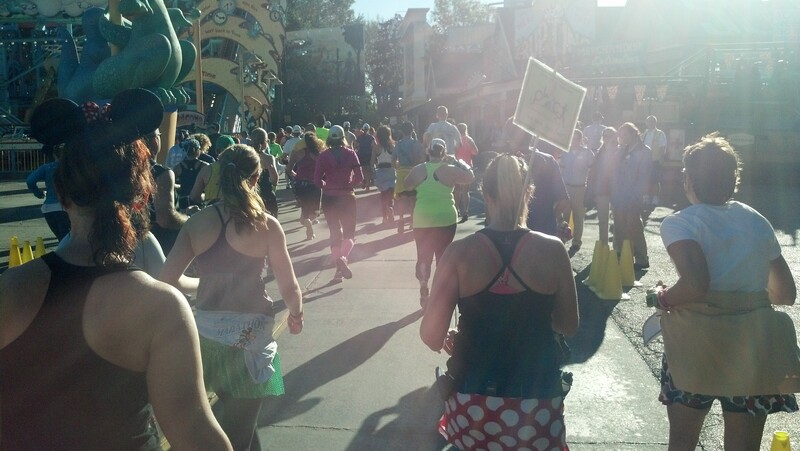 After running the 10K and Half at Disneyland, I know that’s not easy to do. Love reading your recaps! Really inspiring me to get off my bum and get out for a run today. Thanks for reading my recaps! You should absolutely get out and run! Great job! Was nice to meet you before the race! Thanks Heather! It was great to meet you and Bobby before the race as well! You guys are just as nice in person as you appear to be on your blog. 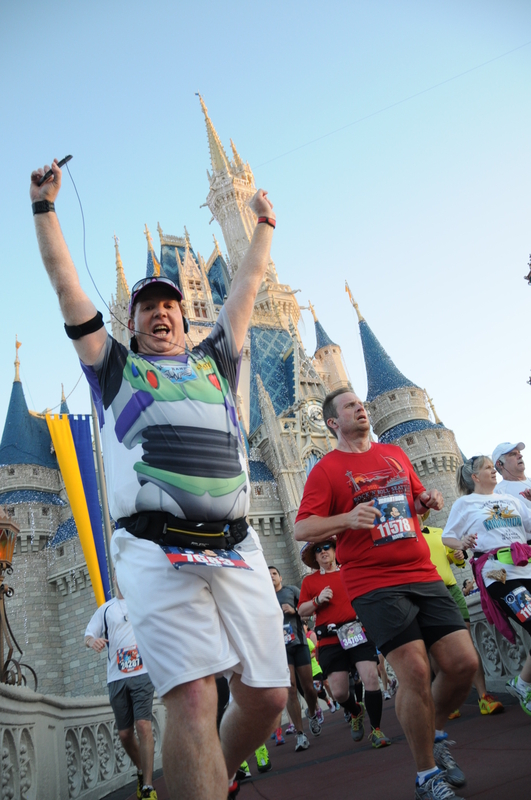 It blows my mind to see that you followed the Dopey Challenge with running the Neverland 5k, Tink 10K and Tink Half the following week.